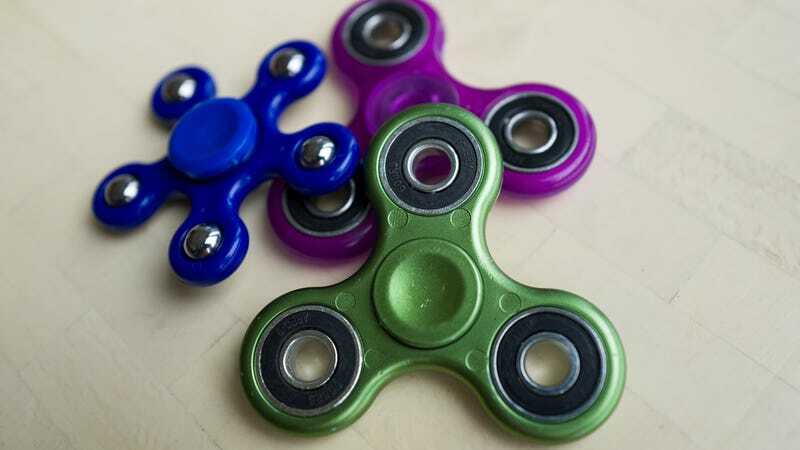 Kids are already over fidget spinners after adults rapidly made them uncool, but a team of scientists in Taiwan has found a nifty way to repurpose these small toys. They turned them into inexpensive centrifuges that could allow health workers in impoverished areas to carry out certain blood tests with ease. Centrifuges are used to separate out the main components of blood: plasma and blood cells. Plasma can be then tested to confirm health conditions like HIV, viral hepatitis, and malnutrition. This separation is usually done with relatively expensive, electrically powered devices that can spin fast and long enough to create the needed centrifugal force. But researchers at the National Taiwan University wondered if there was a low-tech way to accomplish the same thing. Fidget spinners, funnily enough, weren’t the first toy they tested out. The tests they came up with were relatively simple. First, they put small samples of blood into three slender tubes and taped each tube to a different arm of a store-bought spinner. 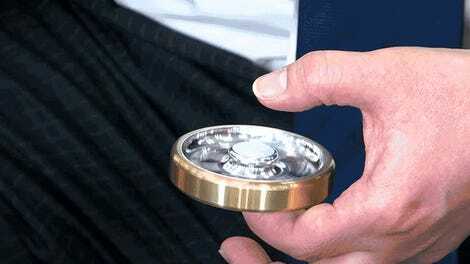 Then they spun the spinner as you typically would, waiting for it to stop on its own before spinning it again. They spun them as long as it took before they could see a decent amount of the distinctive yellowish plasma. On average, it took around four to seven minutes for plasma to separate out, with three to five finger flicks needed. 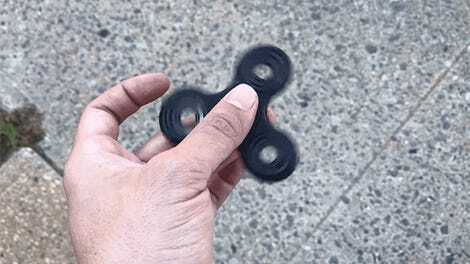 Tests showed that, on average, about 30 percent of the total plasma in a sample had been filtered out through the fidget spinning. But the filtered plasma was also 99 percent pure plasma. To test their devices a step further, they laced the blood with a protein belonging to the HIV-1 virus, the most common form of the disease. And when they screened the filtered plasma with a paper detection test looking for that specific protein, they were able to confirm the presence of the virus. 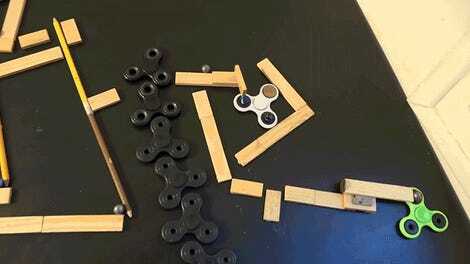 All in all, the fidget centrifuge had done its job well enough. Their findings were published in December in Analytical Chemistry. Chen said that cheaper, low-tech centrifuges would be a boon to doctors and hospitals in areas where medical resources are limited. You wouldn’t have to worry about keeping blood samples preserved for long periods of time before they can be transported to major testing centers. And the added speed in getting back results should make people more willing to go through with testing. “My personal interest is to develop diagnostic systems for use in resource-limited areas, so I always tell my students to imagine that they will do all the tests in the desert and they can only carry a backpack with them,” said Chen. As it turns out, this isn’t the first time scientists have tried to create a low-tech centrifuge. In 2017, bioengineers at Stanford University were able to create and successfully test out a paper centrifuge with materials totaling 20 cents. The design of the paperfuge was also based on an ancient spinning toy, the whirligig. 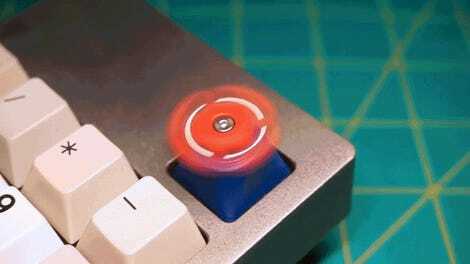 Given the recent fidget spinner fad, though, there should be plenty of discarded spinners to retrofit into centrifuges. Chen noted that his four-year-old son has three fidget spinners of his own. Chen and his team are already trying to test out their spinner centrifuges in the African country of Malawi, conducting blood tests on site. They’re also testing custom-made, 3D-printed, handheld devices that should be even more efficient, low-tech centrifuges. They hope to publish research on those devices later this year.